The nation of Brazil is taking a long, hard look at its checkered past. Some of what it sees is in need of a whitewash, cleaned up and scrubbed so that it makes good reading in history books. Slave uprisings, the likes of which were steeped in bloodshed, are part of its folklore. And Brazil is finally accepting capoeira as the true black power of its nation. For several years now, Brazil has skirted its heritage with capoeira. It has been overlooked, disregarded and dismissed. Historians battled against bureaucratic red tape to find the clearing, some gaps in history had to be filled in. A few years ago an 81-year-old Portuguese man, an eyewitness to the open gaps in history, told his story; the story was about capoeira. Vicente Ferreira Pastinha was the man who did the filling. What he talked about at length were the slave uprisings against the cruelty of persecution and the tool of self-defense employed by the slaves, created by the blacks. Now that Brazil is taking its reluctant look, it is learning about capoeira and wincing at what it has learned. Descriptions aptly outlined by the old man attest to fast-moving arms and legs battling the onslaught of intemperate slave owners, fighting against the huge organization of oppression only to be pressed down in bloody defeat. Capoeira had its most terrifying results in the slave uprisings against the plunderers of human dignity, the landowners who were in operation since the colonization of Brazil by the Portuguese. With each suppression came more and more restrictions until at last, weary and beaten, the insurgent African natives, the slaves, were defeated. As the white populous worked on the ledgers of history, they erased the black marks of capoeira, pretending it never happened. Pastinha remained alive and brought the reality of the past into full focus. Kept alive in the secrecy of hardened souls, the martial art continued to be taught and learned, and if movements were displayed, they were said to be a harmless native dance. This was the way capoeira survived the torture of time. Pastinha revealed how the cultural aspects of the art seemed to vanish and how desperate students used the art to break down the statutes that were placed in their way. That they used capoeira for damage and destruction without rhyme or reason is also part of the haggard history. Without the culture and the heritage, much as that taught in the world of the martial arts, there was nothing save destruction and demolition. Again and again, insurgent blacks were put down in one after another bloody encounters. Capoeira’s heritage seemed to vanish for good. Now, 81 years old and blind, destitute save for the income that has been secured from devoted followers of the art, Pastinha is cared for with the respect of students who look at him with the same dedication that Japanese karate and judo students look toward their sensei. He lives in Salvador, Brazil, and still partakes in the martial art, although the years and the disregard have taken their toll on his prowess. But as Pastinha has revealed the past, a 68-year-old instructor known only as “Master Bimba” is advancing it to the future with his instruction in the martial art. Since he has been teaching capoeira, many practitioners have passed through his hands and are advancing the art further still. Muniz and his group, the Olodum, are performing demonstrations wherever they can find an audience. Their efforts at folklore festivals have garnered them international prestige, despite the backhanded help given them by national officials. In 1968, the Olodum represented Brazil at the Third Latin American Folkloric Festival staged in Argentina and took second place after finding themselves winners of three gold medals and one silver. This year, they garnered a first place win at the Latin American Festival held in Peru. So commanding was their performance, supported by musical instruments, which are part of its clean-scrubbed look, that the Brazilian Ministry is paying homage to the art with the inclusion of capoeira demonstrations on its “official” schedule of national demonstrations. But its homage is to the development of the black man in the martial arts. Although the students today are members of all races, much like many of those studying Oriental martial arts are Caucasians, the Negroes are paid the most homage through their development of capoeira. Nothing is making the black man walk tall more than his tie in the culture of the martial arts. This heritage has become entrenched in the folklore of the martial arts history. And there’s nary a tinge of the Oriental in its makeup. How strange it was for the heritage to start in Brazil and seemingly end there, because slaves were traded and deposited all over the world. Quite possibly, had there been instructors in the martial art in the United States, capoeira might have changed the face of history in North America. This is not a treatise on civil rights; it is a testimony to an austere and legitimate martial art that identifies with all of the traditions of the other martial arts forms. 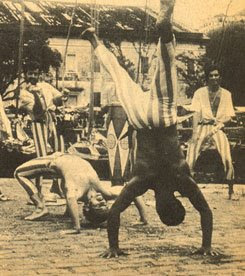 As the Japanese warlords oppressed the Okinawan populace, causing them to seek an effective means of self-defense, so it is with capoeira, developed from the black African who was trained to fight the elements in his homeland but turned to use his training to fight against the tormentors of human dignity in Brazil. Representatives of Brazil, those who wish to look with pleasure on the history of their nation, would like the demonstrations of the dance to continue and be treated as a dance. Indeed, capoeira, because of its potentially dangerous aspects, must be practiced as a dance, as a “kata,” but there cannot be a “kumite.” The practitioners know the law and are forced to accept it, but they earnestly believe that the art could be a dynamic sport if the reigns of government myopia were removed. Admittedly, there have been many practitioners of the art who are working out with no punches or kicks pulled. It has resulted in some damaging effects, and even they recognize that the unleashed power of the art must be tempered somewhat for a sport in which the nation could take pride. As Gichin Funakoshi tempered karate and Jigaro Kano tempered judo, the leaders of capoeira, perhaps Master Bimba, are looking for that combination of sport-art. The emphasis on capoeira is on muscular strength, joint flexibility and rapid movements. All of these are calculated to subdue, and subdue fast, any threat, any battle. Capoeira makes much of quick body movements as most of the martial arts do. But it places a greater emphasis on the power of the legs, strong weaponry in the employ of trained fighters. A capoeira man may meet a fighter face to face, but in a fraction of a second he can flip to the ground, shooting a strongly placed foot into a vital attacking area. It has been said that the capoeira fighter, trained to put punch-power in his foot, can effectively destroy a man mortally with a well-placed kick! That it whets the interest of those who see it has been fairly well documented. In Los Angeles to attend a folklore festival, the members of Olodum were besieged with requests from students to demonstrate at local colleges and universities. At every demonstration, there was much interest in bringing the martial art instruction to the United States. Many of those people making the requests were, to no one's surprise, from the black community. In Sao Paulo, Brazil, Waldemar Dos Santos is the man in charge of making capoeira popular. His is a mission that has seen the face of determination muddied by blockades to his perseverance. How “dirty” has capoeira been or become? The history books are not clear on this point, either. There are many legends surrounding the martial art and explaining how it was used by Brazilian sailors who picked it up and “adapted it” from the slaves before them. According to some sources who reluctantly admit it, the sailors used capoeira to “fight for keeps,” taping knives and razor blades to their bare feet and hands before entering a fight. Dos Santos shrugs his shoulders on this facet. Perhaps that was how the art was “bastardized” by the Brazilian sailors, but he has enough confidence in “empty hand” and “empty foot” facets of the art to bypass that addition. Recent police records in Rio show what happens when capoeira gets out of hand. Military police tried to arrest a drunken capoeira (the term is used for the fighter as well as the art) nicknamed “Master Satan.” Satan took on a 24-man platoon and fought them to a draw. Seven policemen were hospitalized, two with broken arms and two with split livers. When Satan still stood defiant after a battering by 24 billy clubs, police had to decide whether to shoot him or let him sleep it off. They decided to try the latter. Police were called wherever it was practiced. Now, at long last, it is being appreciated for the thing of physical beauty that it really is. Speed, agility and multiplication of force is the key. Pastinha is still the prime authority on the art, and he has seen it develop to a point of respectability. Master Bimba is the foremost practitioner and teacher in Brazil, and his students are as enthusiastic over the techniques as students anywhere. There are some who are unhappy that it is locked into the demonstration aspect, colorful though it may be with its musical accompaniment and bright costumes, ofttimes striped trousers that give off a garish and more “carnival” appearance than most. At least the art is being nurtured and someday perhaps, if it continues to live and gain in popularity, capoeira may grow into a full-fledged martial art and a national endeavor. Right now, one university accepts it as part of its curriculum within its folklore program. Moving it over to physical education may be a tricky accomplishment, but until that day does arrive, the followers of the art will continue to demonstrate it, allowing people to forget it is really an example of black power.